It is clear that Greenspan now must take the blame for presiding over an era of cheap interest rates which created a speculative bubble. He cannot claim he was not warned of the risks. Take two incidents from the 1990s. The first came before he made his 1996 speech referring to “irrational exuberance.” In a Federal Open Market Committee meeting, he conceded there was an equity bubble but declined to do anything about it. He admitted that proposals for tightening the margin requirements, which people need to hold against equity positions, would be effective: “I guarantee that if you want to get rid of the bubble, whatever it is, that will do it.” It seems odd that since then, in defending the Fed’s inaction, he has claimed in three speeches that tightening margins would not have worked. Even as things went completely wild, Mr Greenspan dismissed those who warned that a new bubble was emerging. It was just a case of a little “froth” in a few areas. Later, after waiting until 2007, two years after he left office, he conceded that “froth” had been his euphemism for “bubble.” “All the froth bubbles add up to an aggregate bubble,” he told the Financial Times. The man doth speak in parables! Mr Greenspan was in charge of supervising and regulating much of the banking industry for two decades. 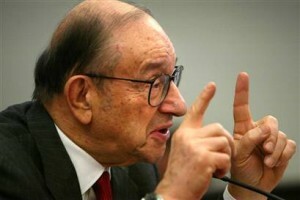 Mr Greenspan now realises that something big has happened and describes it as a “once in a hundred years” event. But then, so is Alan Greenspan.